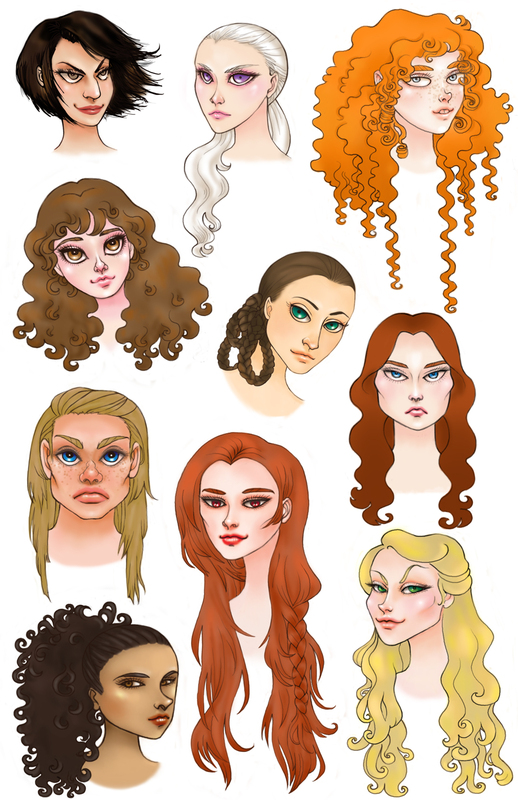 Characters belong to George RR Martin’s A Song of Ice and Fire and HBO’s A Game of Thrones. I just love drawing them. All of these are beautifully rendered but your Brienne is exceptional. Have you though of rendering her as a whole figure, complete with the cobalt-blue armor? I’m also curious to see how you’d depict Sansa and Arya. Anyway, I love your work and will check out the rest of this site. Great stuff! Hi Steve! Thanks a bunch for your comments! I am so happy you like my Brienne. She was a tough one and I remember spending ages on her nose until I was satisfied, and I actually have another version of her where she looks really doe-eyed and innocent. I kept the eyes the same but her expression changed a bit…and for me that seemed right since she was always described as having those lovely innocent eyes. Okay, I just saw some of your other ASOIAF art and I’m blown away, particularly by how you nailed Arya wielding Needle. Also, your Jon Snow? Outstanding! I’m glad you found the others!! I love drawing Sansa and I haven’t done one of her in a while, so it’s probably high time for a new one. I still intend to do a mob scene image one day….and more Arya…and about a thousand other things. Thanks again for all your awesome comments and for stopping by.